The readers that taught me my kipper skills have had the system passed down through generations and can trace it back to the first deck at the end of the 19th Century. I intend on sharing here enough information for you to start on your Kipper reading path and encourage you to read my book (even if it weren’t mine I would recommend it!) and watch a few of my “how to” videos on YouTube. Cards are available on Amazon as well, click here. What makes the Kipper Deck so interesting and compelling? 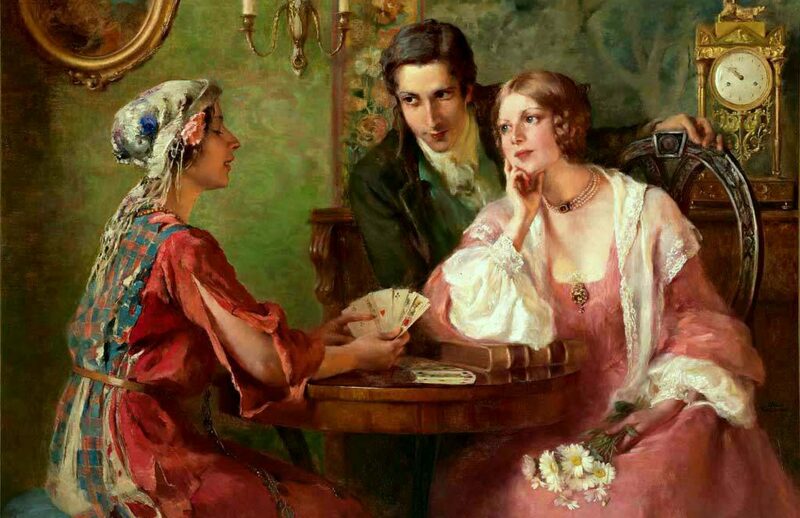 Lenormand readers have mainly made the leap into the Kipper world and the lack of material available has in fact made them even more mysterious, with most using the cards in a Lenormand fashion. Readers are interested because the cards themselves are situational, opposed to the Lenormand symbols. The cards explain complex relationships and psychological situations, if we think of Tarot as Spiritual and Lenormand as Practical we can think of Kipper as Situational. That by no means implies that the cards are only for these purposes, but fundamentally this is a good reference. Kipper is your every day deck, it will tell you what is happening within the home and within your close circle, it will advise you of all domestic matters and will do a great job of advising you on personal interactions. Kipper should be on every reader’s shelf, it can be used to answer specific questions of a relationship dynamic or of situational relationships, motives and psychological incentives can be easily determined. Whilst Lenormand can advise you what “issue” is arising, Kipper will advise the reader of the situation behind the scenes motivating this “issue”. Why my information is the best available source right now? Not only do I live a stones throw from where the first deck was released and been trained in Kipper by Traditional Bavarian readers, I also speak fluent German, have read so much source material, have a BA Hons in French and German thus giving me the advantage of being English Mother Tongue Speaker, Fluent German Speaker and a Card Reader. This combination gives a unique insight into what has so far been missed in the translation of Kipperkarten Meanings and Methods. ​On top of that I pride myself on just being nice and sharing as much info as I can to allow Kipper to be read as it should be. If you see the following words being used by a source… auspicious versus inauspicious techniques, Main Characters, multi directionality of certain cards and cause & effect – you can be sure that the person writing/teaching either has my book or they have taken one of my courses 🙂 However, much information has been shared and then added to by those who do not really understand Kipper, so don’t trust everything you read and if you do have questions please comment on my YouTube videos or join my groups on facebook – I am always around to sort out the good from the bad so that you get right to the source of an amazing Kipper foundation.